Dr Douglas Lush, we have met before, as you may recall. In your response to my article in the Gisborne Herald, you call me a conspiracist. Did you look at the evidence on the back up blog, at the bottom on my Gisborne Herald article? You were born around 1970. As ACTING Director of Public Health you had a large library at your disposal, with the exact same information I have. How did you miss out on catching measles, mumps, rubella or chickenpox since all those diseases routinely circulated at that time, and there was no MMR or chickenpox vaccine for you to have as a child? Neither was there a Hib vaccine. Nor a Hep B vaccine. You certainly didn't "escape" whooping cough as a child, because you were surrounded with vaccinated people ... because the vaccination rate for DPT was appalling (I have the data applied for under the OIA over 20 years ago), and ... the vaccine didn't work. I refer you to the following Department of Health graphs on my website, in particular to the Communicable disease December 1987, which clearly shows the rising whooping cough rates when you were a child. So much for herd immunity. In 2013 you received an Expert Review in which Professor Grant explained on the front page, that the introduction of the pertussis vaccine has had no impact on the circulation of pertussis in our population. In fact he goes on to state that the hospitalization rate between 2000 - 2005, was 1.5 times higher than the 1960s. It is now, higher still. The graph on the following page, should make any honest man blush. I also have the Department of Health graphs for cases and deaths from diphtheria from 1873. Have you? Because if you have, you will know that the use of the diphtheria vaccine in this country had nothing to do with either decline in deaths or cases. Both declined drastically before the vaccine was incorporated into the DPT vaccine in 1960. It was not used during the polio years, and before that, had a maximum uptake of 9 - yes - NINE measly percent. But back to your story . . . . In the year you were admitted, all medical students were first blood tested. I knew quite a few in the years you were there. One was a Maori woman who wasn't vaccinated either. All she "needed" was the Hep B vaccine. She told me about her vaccinated colleagues showing no titres, who were re-vaccinated, a topic wryly discussed with one of your tutors, Dr Roger Booth. See, in the 1990s I practically lived in Auckland Medical School's Philson medical library, often talking to medical students, so I know what was going on at the time. Even if you had no titres to anything, you would only have had DPT, polio, Hep B and MMR vaccine. That's it. I could bore everyone with a thorough refutation of the majority of your casual soundbites, but most people who know their way around this website, have already read the peer reviewed medical literature on the subject. But one point I will deal with, is your opinion that I merely mouse-hunt on Dr Google. You are aware, are you not, that years ago, Google and Gregory Poland from Mayo Clinic banded together to change Google’s configuration so that anti-vaccine material was much more difficult to find? What Mayo Clinic didn’t appear to realise, was that their reconfiguration of Google searches has actually made it much EASIER to find the information in medical search engines, which points people to the truth. Let me give you a tiny glimpse of one of my book cases in my work room …. Pubmed of course, continues its policy of never putting up an abstract on peer-reviewed medical articles which might be of interest to people like me, which is of course, a dead give-away to ensure that ways are found to read it. All anyone has to do, who wants to find out the truth, Dr Lush, is to first, read the vaccine package inserts, then your own Immunisation Handbook, THEN spend time on medical databases and go to medical libraries and read the last 127 years of the BMJ and Lancet. Will that take time? Oh yes. Its taken me 35+ years and I'm still going . . .
Is it worth it? Absolutely. Why? Because Dr Lush, I KNOW what was in your library under your office in the Wellington Department of Health building. 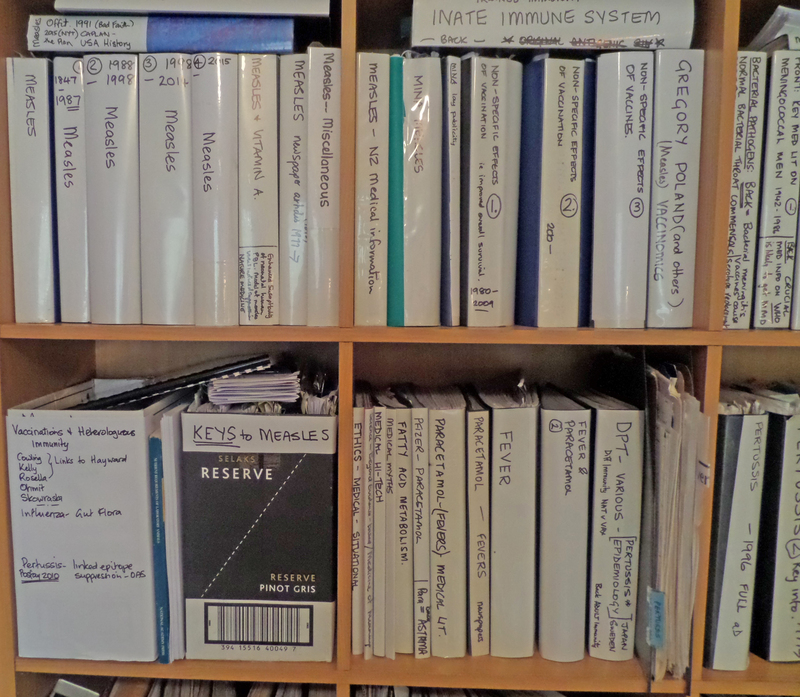 I have every Immunisation Handbook that has ever been published. I have KEPT the vaccine inserts that come with the actual vaccine from years back. I KNOW my way around Medsafe’s website. I KNOW what is in the appendices to parliamentary journals from the late 80s in the History room in Auckland Library. I have READ the official year books. I’ve spent 30+ years reading, so that I KNOW BOTH sides of the story, which is why I am now an ex-vaxxer. For those interested, here is the latest Immunisation handbook, published last month. May 2017 New Zealand Immunisation Handbook. Much of it is an un-scientific joke. Sometime, I will scan the measles section of the 1993 Immunisation handbook and put it side by side with the 2017 version and you will see just how low science has fallen. Even more interesting, on page 130, they list as “references”, blogs by fellow admirers, Helen Petoussis-Harris and David Gorski, whose name they even managed to spell wrong. This takes 'peer review' to new heights of lunacy. When "peers" . . . "review" each others' opinionated hot air, that makes their words “peer-reviewed” science worthy of Medsafe acclaim? Truly, the world of science has fallen flat on its face! I presume you have a family tree, Dr Lush. Have you looked at it lately? Has it ever puzzled you, as to how it is that your parents, and grandparents got to live to a ripe old age without imbibing in the long list of childhood vaccines which you extolled (tetanus, diphtheria, polio, whooping cough, Haemophilus influenzae type b, pneumococcal disease, meningococcal disease, rotavirus, HPV, hepatitis B, measles, mumps and rubella) in your third to last paragraph? Before you fluster around and tell me that measles has always been a deadly killer and without it, we would all have been dead in the water, have you read what the premier instigator of the measles vaccine, Dr Langmuir, had to say about WHY the vaccine was made? Have you read what one of the greats, Dr Sencer, had to say about measles eradication? Skeptics Part Three: Living Proof. Intravenous vitamin C used in infection does not cause kidney stones.